Anti-PROM 2018 Registration is OPEN! Update: Help Save Mik’s Hidden Hearts! Must Read FAQ! Anti-PROM 2017 Update – Are you on the list? Think you have Dysautonomia? - "Poor Man's Tilt Table Test"
Can’t Miss Anti-PROM Wrap Up – Pics & More! 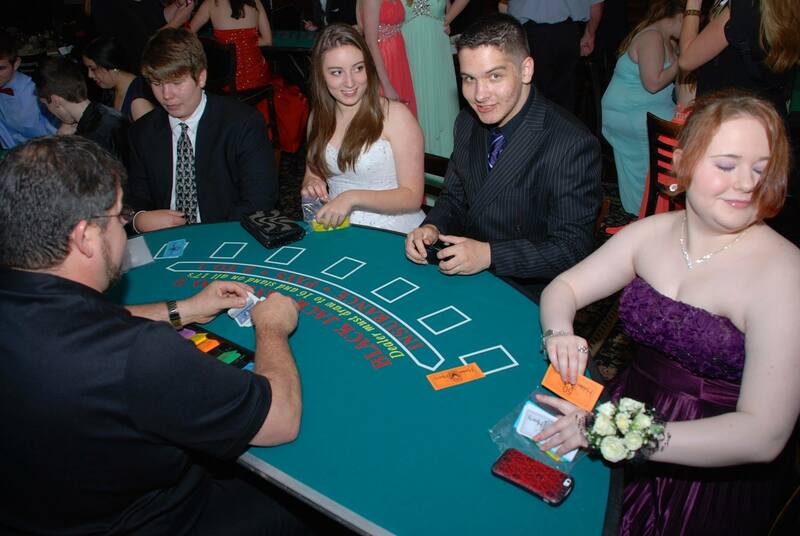 The second annual Mik’s Hidden Hearts Alliance Anti-Prom for our hidden teens and young adults was a huge success! I am still in a bubble of happiness about it (with a little bit of sadness that it’s over…). My devoted family and friends worked so hard for months to pull everything together for this event and it definitely showed. Without them, the Anti-Prom wouldn’t even be possible. I thank you all so much and I love you all. Ya’ll are my heroes. 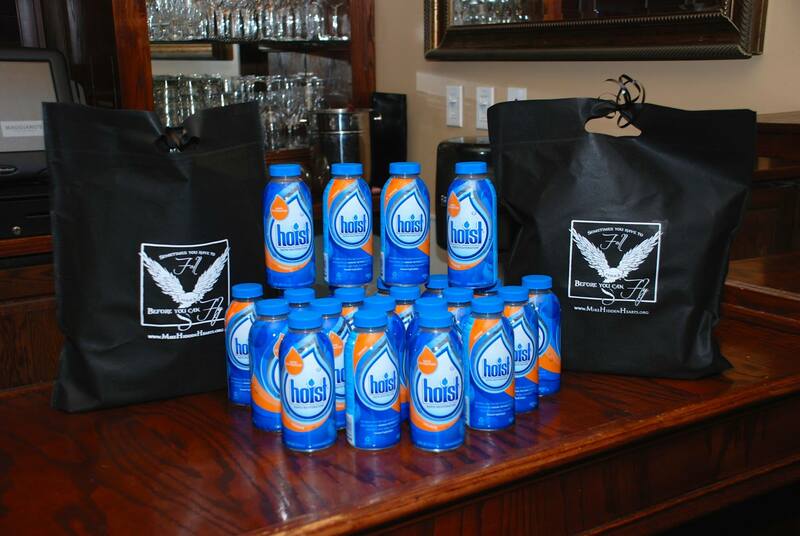 This year, we held the event at the lovely Maggiano’s Italian restaurant in the Houston Galleria area. The always amazing Mike Eichenberger was our emcee and our night consisted of dining on a delicious dinner prepared by the restaurant, casino games, TONS of prizes and a photo booth from Jonny Black Productions (which was such a fun addition this year!). 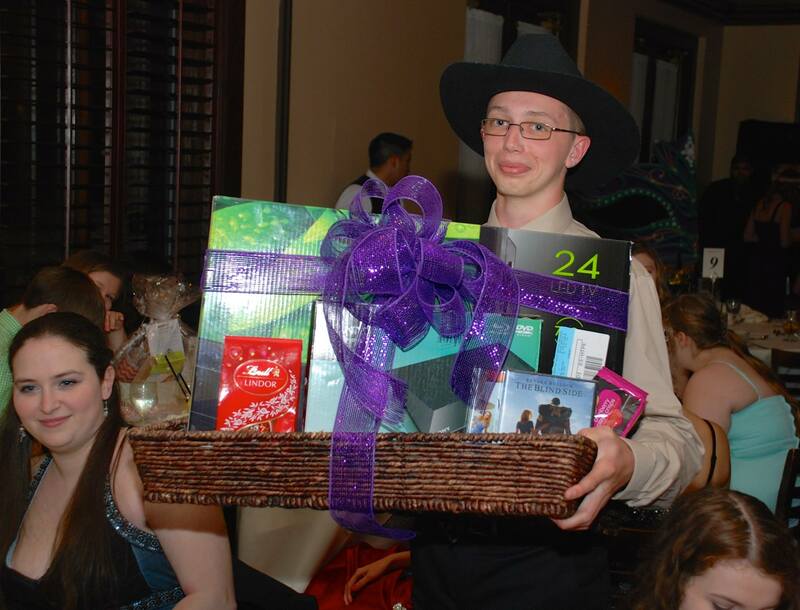 SWAG BAGS: Each guest went home with a swag bag made possible by the Abbott Family, Allen Family and Toman Family. Each one was complete with a new edition MHHA t-shirt, MHHA coffee cup, wrist band, candy, drinks provided by Hoist, and more. PRIZE BASKETS: We also gave away numerous big prize baskets that were completely awesome (if you ask me) with the top 3 prizes included: a Texan’s themed basket which contained four tickets to their next game (donated through the Katy Classical Academy donation drive/ Johnson Family), 24 inch Flat Screen TV / Blu-ray dvd from the employees at Enterprise Bank Pin Oak location, and Beats headphones/gift cards basket from Enterprise Bank employees at Pin Oak location..
Perhaps one of the biggest highlights of the night was that three news stations came up and did a report on the prom. 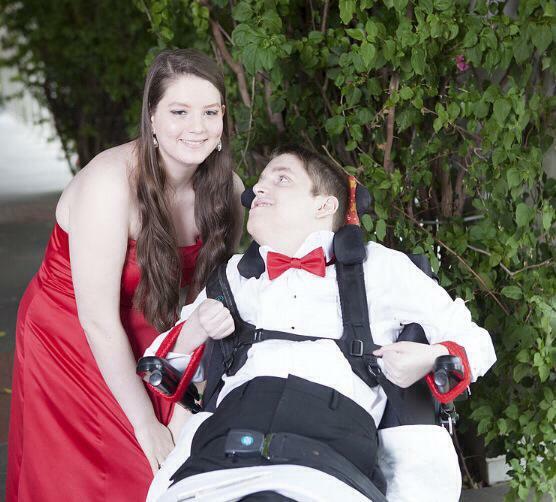 It was quite a surprise to me and I was both excited and nervous when I was interviewed, but I was pretty pumped that we were going to have word get out to those watching of what Dysautonomia is and what Anti-Prom\MHHA is all about. 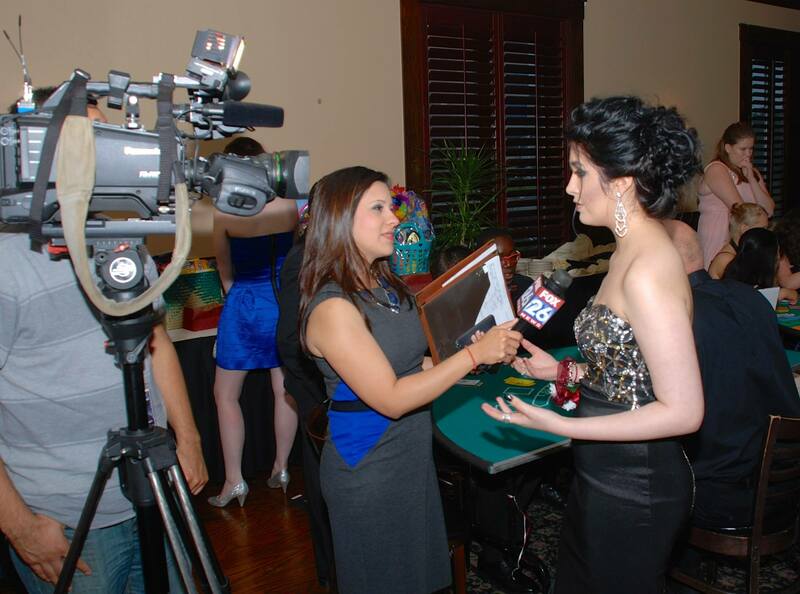 Much thanks to ABC 13 News, Fox 26, and Univision for covering the event. I would also like to thank my fellow hidden teen, Natalia Rijos, for speaking Spanish on our behalf for the Univision interview – you are a wonderful spokesperson! I also want to thank my Anti-Prom committee which includes my co-chairs Lori Allen, my Aunt Ronda, and my mom. Thank you all so much for the hours of work you put into this event and for running with my crazy, over-the-top ideas and making them possible. Lori created the beautiful Anti-PROM masquerade decor, coordinated many details with Maggiano’s and so much more to list. She is so absolutely talented and she ran with the vision I had for the prom and it came out beautiful (You rock Lori!!). My Aunt Ronda took off a whole week of work just so she could focus on putting together all of the door prizes, prize baskets, and swag bags (as well as running all over town collecting donations). Much appreciation to her team of volunteers across town for literally dropping everything to help her put together all the gorgeous prize baskets and door prizes!! My grandmother, aka Nana, also helped tremendously with this and I thank you both for both being some of my biggest advocates and for everything you have done for me, this event, and MHHA. I also want to thank my mom so incredibly much for everything. For staying up late hours creating designs, coordinating, and spreading the word. For running around on the brink of insanity to make sure everything is pulled together – for always being a great mentor, and for being an amazing mom to me and to my two siblings in the middle of it all. 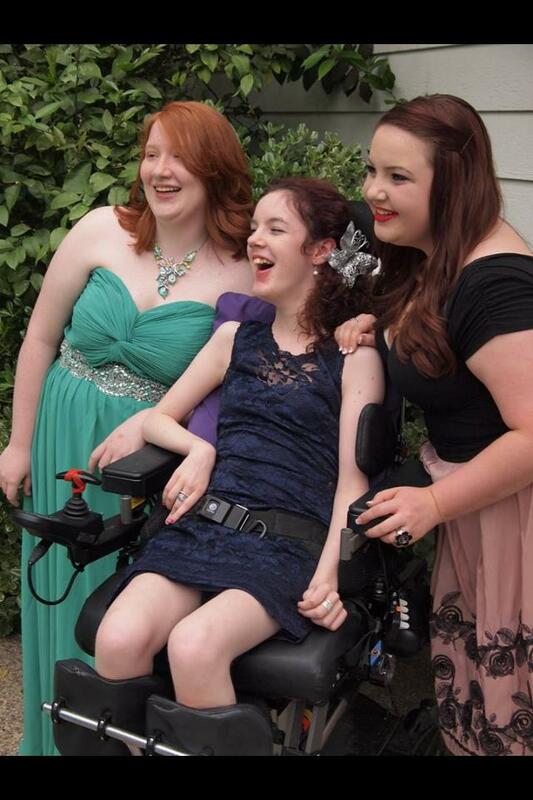 The Anti-Prom was a magical night and was all the more special to me with this being my senior year. To see the smiles and joy on my fellow hidden teens and young adult mentors faces, was a privilege and I am so honored to be among so many inspiring people. It is a memory I will always cherish and I look forward to giving other hidden teens this special night for many more years to come. Big thank you to Brett Perroux Photography and Tiffany Daniel Photography for capturing our event beautifully! See below for their link for the photos. 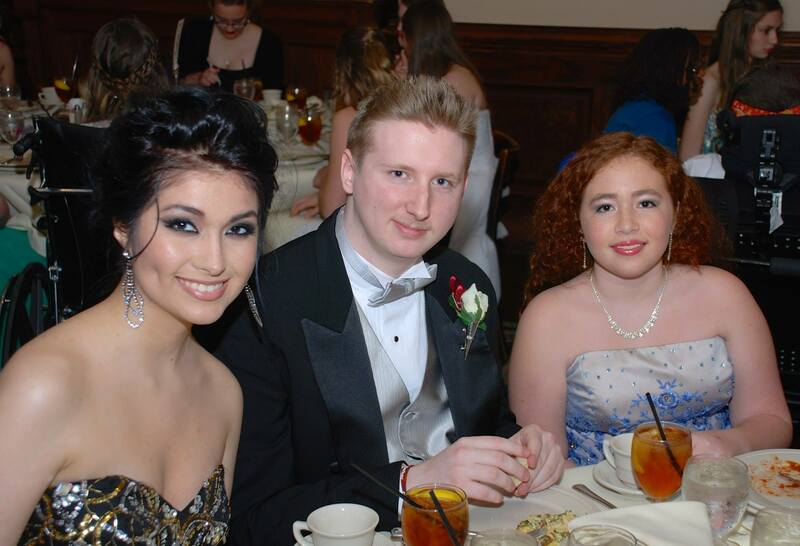 MHHA Anti-PROM could not be possible without our generous volunteers, donors and sponsors. -Our volunteers who helped set up, deal, supervise, and so much more! Our entire Anti-PROM volunteer team! Brett Perroux Photography and Tiffany Daniel Photography – for once again capturing our event beautifully! Thank you!! Brett Perroux Photography Anti-PROM Pictures: Pics below. Please help spread awareness! Like our Facebook and Twitter pages. Learn how you can help MHHA here. We appreciate all of our angelic sponsors. With every big or small donation, we are able to help more Hidden Teens. Special thank you to our Gold Heart Sponsors at Lamb Foundation for Dysautonomia Research, Spero Rehab and J Knesek & Assoc. In Mik’s Words: Too often we teens with Dysautonomia and other chronic illnesses fall into the trap of frequent doctor’s visits, hospitalizations, therapies, etc etc. In between all of those, well.. mostly, we just feel quite simply – sick! I know we at Mik’s Hidden Hearts Alliance can’t change how people physically feel (wish I could), but I know we all together can make each other feel better emotionally. Socials are a great opportunity to get out of your day-to-day medical routine and just have FUN! Which leads me to do the wrap up of our December social – Christmas and Keeno Potluck Party. We all had an absolute blast! 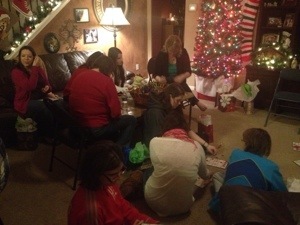 It was a fun evening of playing Keeno (think Bingo but with playing cards) where everyone went home with a prize and savoring all the tasty treats, appetizers and soups everyone brought for the potluck. Seeing a bunch of smiling faces was so awesome and we were exceptionally happy that several of the hidden teens and their families in the area were feeling up to coming out. 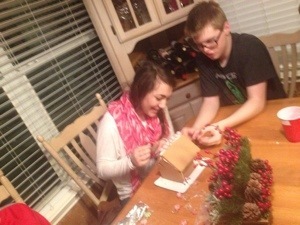 This was a perfect way to start the holiday season right! Join us Thursday, January 16th, 1 – 3:30pm, at Glazed Over Ceramics Studio for a creative, fun activity making fused glass! You’ll create a beautiful piece of glass by laying out your design of glass chips on a glass plate. It is later fused and shaped. The studio also offers ceramics that can be painted, but the glass is really fun and unique. No special glass skills needed! Glazed Over is waiving the table fee for our MHHA group. Everyone will select and pay for their own projects. (MHHA will offset the cost of each teens’ purchase by $10. ) Items range from $18 – $60, with the average being about $25. Your item will be fused and be ready for pick up about 10 days later. If you are able to, please bring a plate of appetizers or snacks for everyone enjoy. Glazed over sells some refrigerated drinks or bring your own. Please RSVP to keri@mikshiddenhearts.org as soon as possible, so we can make sure enough tables are set up. This is really fun for everyone! 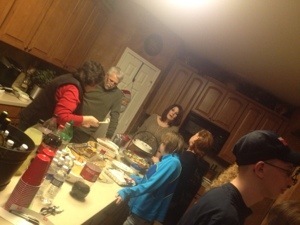 More pics below from our fun Christmas & Keeno Potluck Party!